The quiet Kampot province now shows great potential with both national and international investment companies making investments worth billions of dollars there. Kampot is described as of one of the four potential coastal provinces. Ping Serey, CEO of Cambodia Angkor Real Estate, said Kampot province has great potential for tourism and trade due to its location and good atmosphere – where the largest creek flows to the sea, compared with other coastal provinces. He said the market of land subdivision in the province is better because it is located next to the sea, and so far the project sales have reached about 90 percent. Cambodia Angkor Real Estate has subdivision land for sale, a project that covers 4 hectares and an investment cost of nearly $4 million. It is situated in the Chong Kreal commune, Tek Chhou district, Kampot province. They also sell plots of land for the construction of resort villas for the price of $52,000. Within sight of potential, his company has cooperated with partners from Malaysia and has decided to invest, jointly, an amount of nearly $ 1 million to do a subdivision land project with an area of 7 hectares recently. So far, sales reached over 20 percent. The subdivision land for sale in the new project is priced between $3,861 and up. Besides the above projects, Pallas Group’s Oknha Trey Pheap has also started building an international port at the province – in cooperation with the Kampot authorities and the Ministry of Tourism, under the assistance of ADB – and is building a tourism port worth $10 million in an area named Treuy Koh to attract foreign tourists between Cambodia, Vietnam and Thailand. Last October, the government decided to provide the green light for a development project worth up to $23.2 billion on a project called the “French Riviera Marina” to develop the Kampot and Kep Provinces to become a region that has the potential for residential, shopping malls, ports and commercial center development projects. Chheang Sophanna, president for international sales of the Pallas Group, said recently that his company has development projects in Kampot and Kep that include residential areas, business and tourism sites and buildings, resort-like studio films, equestrian centers, and much more. These have been allowed by the government last October 12, and construction is scheduled to start in March next year. “These are new projects which have never been done in Cambodia, they will have international standards, and aim to welcome all customers from around the world,” he said. According to the company’s documents, the Pallas Group – an international property investment company – had invested in an area of 4,158 hectares in the province and 144 hectares of in Kep. Kampot is located 148 kilometers south of Phnom Penh, while Kep is located 170 km. The Kampot province consists of 7 districts and one city, Kampot, Tek Chhou, Chum Kiri, Kampong Trach, Angkor Chey, and Angkor Meas district, and Kampot town with a population of about 600,000 people. The population in the city is at 70,000 people. Chan Chesda, the provincial governor, said on the phone that the big investment project from the Pallas Group has not started yet, and is in the detailed study phase after its approval from the Council Development of Cambodia. He said that the project is located in the Chum Kreal and Trapangosangke commune, Tek Chhou district. 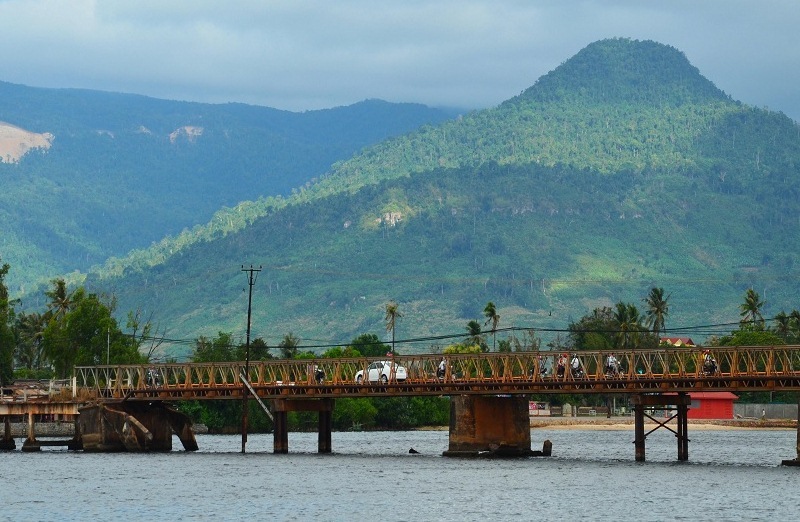 It’s 10 kilometers from the town of Kampot and partly situated in the territory of Kep. The project is located along the sea from the Kampot to Kep province. The concept of development is not adding the soil on the sea, but the firm is dredging sand from the sea to create an artificial island that can see both development and conservation, according to Mr. Chesda. The provincial authority also plans to develop by working with the Ministry of Tourism on an area of 200 hectares of land to build a new tourist area called “Kampot Thmey”. The project has already gone through the Coastal Committee but will now will be studied with development projects to see how good they can work together, according to Mr. Chesda.